I made this Christmas wall hanging a few years ago, borrowing blocks from different books to assemble a quilt which brought together the symbols of the season that most speak to me. Stars appear on all the blocks purposedly. 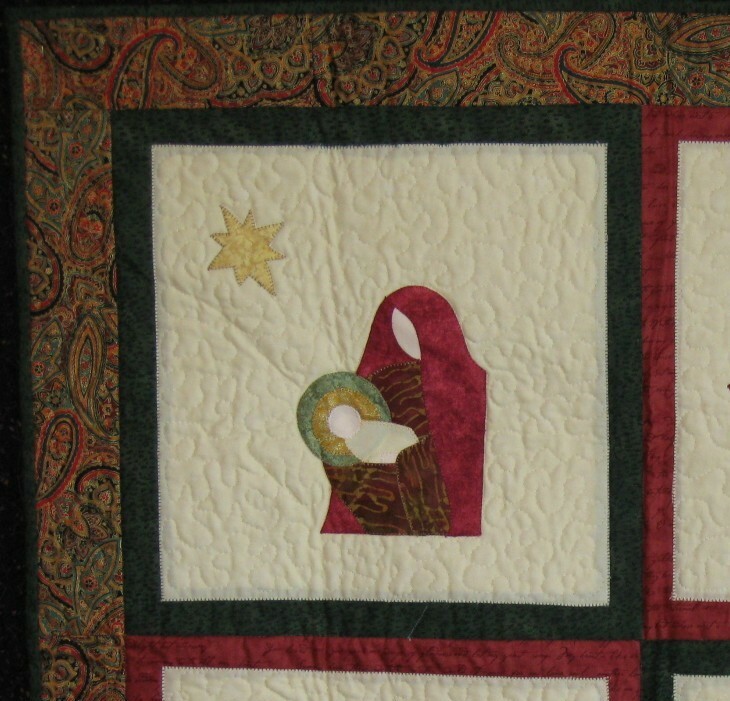 Notice the block on the top left corner: its name is Mother & Child and it was featured on page 73 of the book Quilt a Colorful Christmas, edited by Jeanne Stauffer and Sandra L. Hatch (I found it here). The Christmas tree is on page 143, and it was originally meant to be a Crazy Christmas Tree, although I made it using one fabric only. 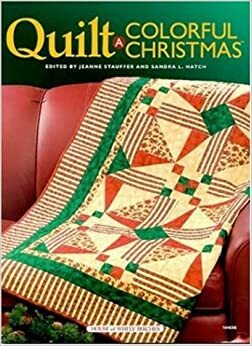 Quilt a Colorful Christmas has wonderful ideas ranging from small wall hangings to bed quilts (I am particularly fond of the rag quilt on page 86 called Denin Pals), including tree skirts, table runners, and Christmas bags. The sampler stocking has a row of pieced stars, one of redwork, and one of applique hearts. So cute! The book also presents ideas for quilting the projects, as well as instructions for the embroidery stitches used on some of the patterns. You are bound to find a project you like in it... and it will come in handy when you run out of ideas for those last minute gifts. Table runners are useful and quick to make... I am thinking of using some of the designs from Quilt a Colorful Christmas to make my own table runner, perhaps with a Santa Claus block on each end and pieced stars in between. What do you think? It`s just beautiful.Have a fun day.Here is very cold and windy.Christmas is around! I ordered the book! The "mother and child" block pretty well clinched it for me anyway since I collect nativities--it will make a cute mini wall hanging--but the rest of your description of the book helped too! Your wall hanging is lovely!